Flight takes many forms on the Outer Banks, from the thousands of migratory birds that travel along these barrier islands to and from their winter destinations, to aviation pioneers like the Wright Brothers who launched the world's first airplane off the sand dunes of Kill Devil Hills. Visitors can also experience the Outer Banks' inherent love of all things aerial by taking flight themselves with a day of Hang Gliding. The same wind and climate conditions that attracted the Wright Brothers, the migrating birds, and sports enthusiasts like daredevil Kiteboarders also lures Hang Gliders to the Outer Banks, for sky-hide rides and unparalleled ocean to sound views. Tow launch sites - With a nearly constant and steady breeze blowing across the barrier islands, the Outer Banks has great conditions in several locations. Adventure seekers can find tandem rides up to 5000 feet, launched via tow plane from Currituck County Airport or the Cotton Gin in Jarvisbrg. Jockey's Ridge State Park - Overwhelmingly, the most popular location for hang gliding expeditions occurs at Jockey's Ridge State Park in Nags Head. The tall sand dunes of Jockey's Ridge comprise the tallest natural dune system on the East Coast, ranging from 80 ft. to well over 100 ft. tall. 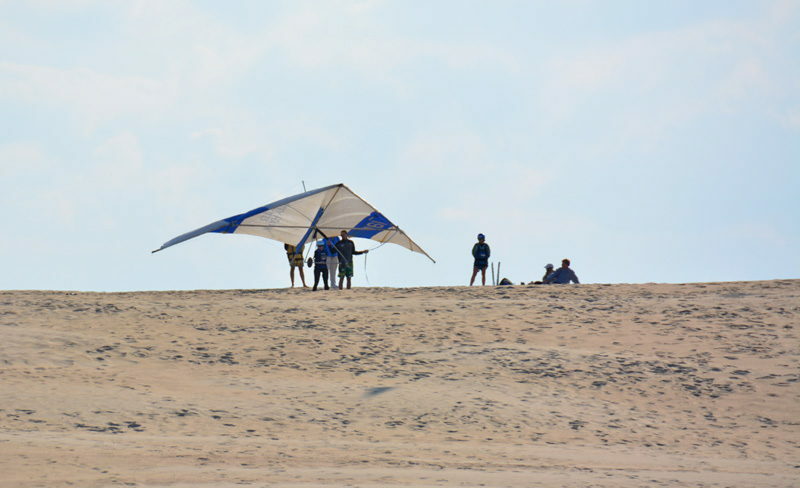 A hang gliding flight launched from the top of these dunes offers amazing views of both the Roanoke Sound and Atlantic Ocean, and as a result, hang gliders have launched from Jockey's Ridge for well over 40 years. In order to take the plunge, riders will need both a US National Park Permit as well as a United States Hang Gliding Association (USHGA) rating. Novices and visitors can also experience the thrill simply by taking a lesson from a licensed and experienced hang gliding school and/or trainer, like neighboring Kitty Hawk Kites. A typical lesson will last three hours or so and a third of the time is typically dedicated to ground training and safety. Then it's off to the Jockey's Ridge dunes via a scenic walkway that borders the park to get a handle on the wind conditions, get strapped into the safety harness, and to start solo trips across the tops of the tall sandy mountains. During these solo trips, gliders can soar anywhere from 5 ft. to 15 ft. off the ground, and can travel as far as 100 yards. While most adult lessons require that riders weigh at least 80 lbs., special kids lessons are also available for younger riders under 75 lbs. Need more of a thrill? 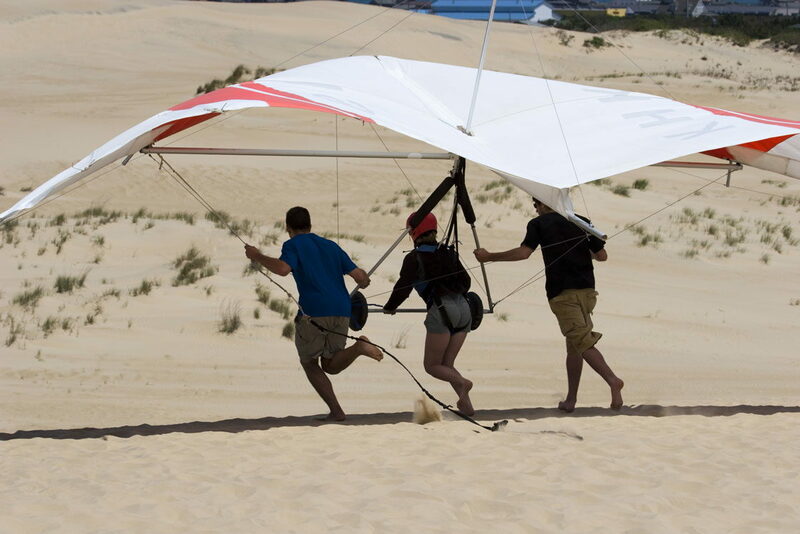 Off the dunes, hang gliders can experience mile high thrills at a number of different schools and launching locations along the Outer Banks. For novice gliders who need an experienced instructor on hand, tandem hang gliding lessons are offered at the Currituck County Airport in Jarvisburg, just a few miles north of the Wright Memorial Bridge. Here, vacationers can experience tandem hang gliding, where the student and instructor are hooked together on a single hang glider for soaring rides up to heights of 2,000 ft. In order to achieve this height from launching off the ground, the glider is hooked to a "tow" plane, an exceptionally light plane that takes off into the air, towing the glider behind. Once the proper altitude has been reached, the glider is released, and the tandem riders are free to turn, dive, stall, and explore the air space over the Outer Banks. Up in the air, gliders will have simply incredible bird's eye views of the Currituck Sound, the Atlantic Ocean, and virtually all of Currituck County. For amplified thrill seekers, a limited number of lessons and tandem flights are available for heights over 5,000 ft., also at the Currituck County Airport and training facility. Vacationers who find they're hooked after a lesson or two can proceed with attending special classes for United States Hang Gliding Association (USHGA) certification, locally offered at Jockey's Ridge State Park. A basic certification will entail that the applicant demonstrates their knowledge of setting up and breaking down a glider, checking all safety equipment, and of course, actually taking flight. During the certification class, the glider essentially performs all of these tasks in front of a licensed witness to earn their certification. Hang gliders should note that there are varying degrees of certification, from a Beginner Rating, which allows solo riders to take off from Hang I rated sites, like Jockey's Ridge, to an Aero-Tow Hang Gliding I and Aero-Tow Hang Gliding II Rating, which enables riders to trail behind ultra light planes, reaching maximum altitudes. Once a rider has their certification in hand, they can also buy their own hang gliding equipment for solo flights, including helmets, harnesses, and hang gliders. 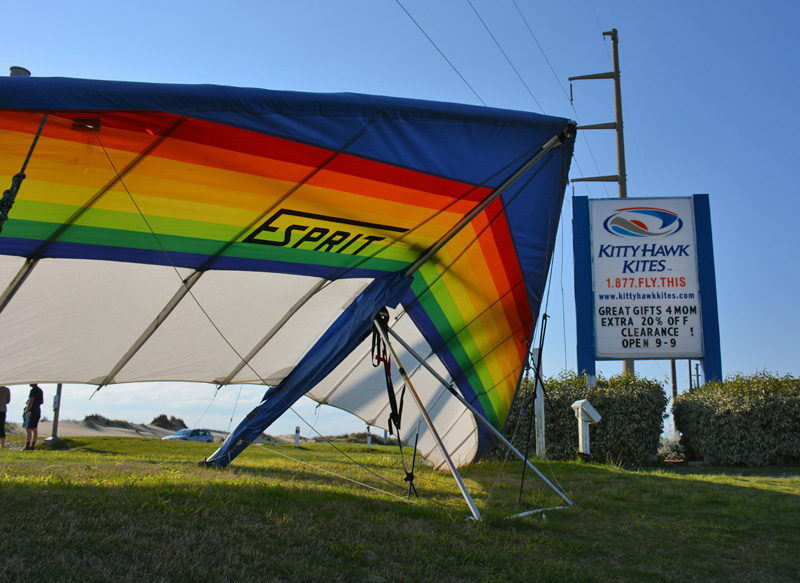 Again, local gliding giant Kitty Hawk Kites has an exceptional selection of hang gliders and equipment available for purchase by USHPA Members. Remember that you must submit your certification well before buying a glider, regardless of where it is purchased, as the order must be approved beforehand. Hang gliding lovers who want to obtain their certification while getting an in-depth hang gliding experience, as well as additional training, can also attend seasonal camps. These hang gliding camps or clinics are weeklong day camps, generally offered in the spring and fall months when wind conditions are at their peak for all Outer Banks aerial sports. From launching and landing clinics to Instructor Certification Programs, these sessions are offered at all levels, and are tailored to the riders' specific needs. 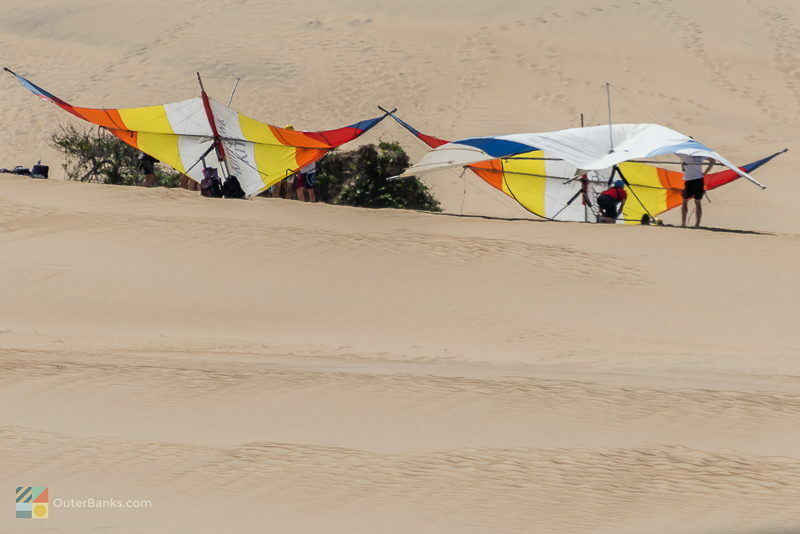 The third week of May, an Annual Hang Gliding Spectacular brings enthusiasts together at Jockey's Ridge State Park and Currituck County Airport for friendly competitive events and fun. Spectators are welcome! Whether you're heading out for an afternoon hang gliding lesson or embarking on a high-flying towed adventure, there are a few essentials you'll want to be sure you have handy before you take flight. Sunscreen: The sun off the Atlantic Ocean and bordering sounds is exceptionally strong, and sunscreen is a must on any outdoor Outer Banks adventure. Eye Protection: Your eyes can be affected by those strong UV waves as well, and the sun can be very bright on the Outer Banks, especially on the dunes of Jockey's Ridge State Park. Sunglasses or other eye protection will help you see clear while in flight. Layers of Clothing: Comfortable clothes are a must, but smart gliders bring layers of clothing along, from tank tops to jackets, as the wind and weather can change in mere minutes on the Outer Banks. On Jockey's Ridge, the tops of the taller dunes can be particularly windier or colder than on ground level. Water: Hang gliding may not seem like the most strenuous of sports on the Outer Banks, but repeatedly walking up the Jockey's Ridge sand dunes, or across the local air fields, can expend a lot of energy. Also, bear in mind that facilities can be limited, especially on the top of the dunes, or on a deserted beach or air field. Plastic bags or sealed containers: Sand can wreak havoc on delicate electronics like cell phones or cameras, so having them sealed in a baggie or plastic container can provide protection against the elements. Camera: Considering the incredible aerial views you'll encounter while mid-air, a camera is simply a must. Stay focused while in flight, but be sure and take as many pictures as possible, as this is one experience you'll certainly want to remember. High flyers love the Outer Banks for its rich history of aviation and its modern reputation as one of the best launching points for aerial and water sports of all kinds. And hang gliding is nothing new to visiting and local Bankers - for decades, adventurous visitors have taken to the peaks of Jockeys Ridge to test out their skills flying over Nags Head in consistently breezy conditions. In fact, an estimated 10,000 students still take to the skies every year to experience a truly unique Outer Banks adventure. With incredible water views, exceptional weather conditions, and some of the best launching conditions and locations the East Coast has to offer, it's easy to see why hang gliding is an Outer Banks sport that has withstood the test of time, and will continue to remain popular for decades to come. Jimmy’s Seafood Buffet is a great stop for an all you can eat affordable dinner extravaganza. The buffet offers over 100 different items. It even serves Jumbo Alaskan crab legs and Jumbo steamed shrimp, something you will not find on any other buffet in the OBX. The buffet offers a variety of seafood and non seafood options. Try some of Jimmy’s seafood options and load your plate with blackened tuna, Louisiana crawfish, steamed scallops and mussels, fried oysters and deviled crabs. Not in the mood for seafood? Fill your plate with carved and sliced turkey with gravy, steak, cheese pizza and fettuccini alfredo. The buffet also offers a kid section. Let you kids load their plates with chicken tenders, hot dogs, broccoli, curly fries and tacos. Don’t forget dessert! The buffet also offers soft serve ice cream, and a plethora of baked goods. Bodie Island tends to cause a lot of confusion, for both the pronunciation of its name as well as its precise location. This small strip of the Outer Banks doesn't get a lot of attention, and most North Carolina visitors simply pass through the area on their way to or from the Hatteras and Ocracoke Island resort towns, or make a quick stop for an up-close-and-personal view of the Bodie Island Lighthouse. If you love Thai food (or have been wanting to try it), you must stop at the family-owned Thai Room in Kill Devil Hills. This authentic Thai restaurant is owned by an incredibly friendly and cheerful Thai family who will make you feel right at home the moment you walk in the door.